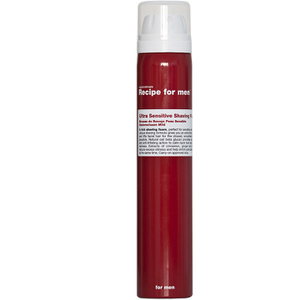 Ultra Sensitive Shaving Foam from Recipe for Men, a brand who create signature male grooming products to enable chaps to make themselves look and feel good at home. Specially formulated with Sebustop®, extracted from burnet, ginger and cinnamon to remove excess sebum and control oil, reducing the appearance of pores. The rich shaving foam is suitable for even sensitive skin and its extra thick lather lifts facial hair for a closer shave. Natural oat beta glucan effectively targets debris and repairs skin, soothing razor burn and avoiding redness. E.N. Lather gently onto wet and cleansed skin before shaving. Rinse carefully. Follow with a splash of cool water.